Mexico has given the world so much. Certain contributions that Mexico has bestowed upon us may surprise you. Read on to catch a small glimpse of Mexico's many gifts. Each year, just before Christmas, poinsettia plants start to make their annual appearance in grocery and retail chains nationwide. The poinsettia has become synonymous with the Christmas holiday season and many bring this plant as a gift when visiting friends and family. Indeed, the plant's bright red flowers lend a joyous presence to any environment and holiday decorations don't seem complete without them. This plant is native to Mexico and originally came from a particular region near present-day Taxco. The Aztecs, whose name for the plant was 'cuetlaxochitl' used the poinsettia medicinally and also as a dye. 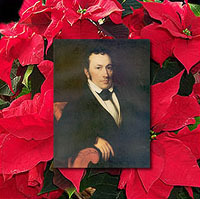 The plant adopted its current name after the first U.S. ambassador to Mexico, Joel Poinsett (1825-1829). This dignitary was so impressed with the plant that he had it shipped to his plantation in South Carolina. Some decades later, in California, Albert Ecke, started to sell the flowers from his florist stand near Hollywood, California. It is believed he found the plant growing wild, in the foothills of present day Los Angeles. Ecke noticed that the plant's flowers would bloom in a profusion of bright red around the Christmas holiday season. The plant proved enormously popular as a holiday decoration and a multi-million dollar business was born. Today, the base of operations is located in Encinitas, California, where the poinsettia is grown in greenhouses and shipped world-wide. Chocolate is one of life's true pleasures. When Cortes met with Montezuma, the Emperor of the Aztec Empire in 1519, he was presented with a frothy drink, presented in a golden goblet that was accompanied by a tortoise-shell spoon. This drink, a spicy blend of chiles, vanilla and ground cacao beans, was called 'xocoatl' which translated, means bitter water. Of course, Cortes' eyes were riveted by the golden vessel that the exotic drink was served in. However, after tasting the golden cup's contents, his taste buds were captivated by the exotic and invigorating taste of this native drink. Cortes soon learned that the cocoa bean was a valued means of currency, its pods utilized to purchase a variety of goods. When Cortes returned to Spain, his ships were heavily laden with gold and silver but also, amongst the cargo was the cocoa bean. Once this magical bean made its way to Europe, its evolution included the addition of sugar which led, ultimately to the creation of, what we now call today, chocolate. Vanilla has enchanted people with its sublime taste for hundreds of years. The first people to cultivate it were the Totonacs, an indigenous people who resided near the Gulf of Mexico in present day Veracruz. Native to Mexico, the vanilla bean is derived from the world's only known edible orchid. Vanilla is used as a flavoring agent in many desserts as well as exotic perfumes. Vanilla is the world's second most expensive spice after saffron and delights connoisseurs the world over with its fabulous taste and unique attributes. Today, much of vanilla's production occurs in Madagascar in the Tropics, however, its birthplace will always be Mexico. The ancient Aztecs held the avocado in high esteem. Today, this wondrous fruit is enjoyed daily the world over, frequently eaten as guacamole. The avocado is native to Mexico, Central America and South America. The Spanish conquistadors, upon discovering this fruit, applauded its attributes in letters written to the crown. They even discovered that the seed, when crushed, releases a red dye that works extremely well for inking documents. Some of these documents survive today. Another name for the avocado is 'alligator pear' due to the rough green texture of its skin and shape. The avocado is a nutrient-rich super food, containing more beta carotene than any other fruit and surprisingly, exceeding the banana in potassium content. As well, the avocado contains many other important vitamins and minerals. The Aztecs definitely knew a good thing when they tasted it! The history of tequila is an interesting one. For thousands of years in Mexico, a sacred drink called pulque was enjoyed, a fermented beverage. Pulque is made from a type of agave, the maguey, which is native to Mexico. Due to the plants appearance, oftentimes it is mistaken for a cacti. The agave was used historically by the indigenous peoples of Mexico for a wide variety of uses. The leaves produce fibers that can be made into rope, clothing and paper. Its flowers and stalks are edible and the sap of the plant produces a sweet liquid called 'aguamiel' (honey water). The Spanish conquistadors, upon their arrival in Mexico, were keenly interested in the Aztec's drink of choice, pulque. Curious and motivated, with their supplies of brandy running low, the Spaniards set out to make their own beverage from the agave. Promptly, they had distilling pots sent over from Spain and as a result, North America's first indigenous distilled alcohol was born. Some decades later, a Spanish aristocrat discovered the blue agave plant which grows in a specific region of Mexico, in Jalisco state. It is the blue agave that Tequila is derived from. The rest is history, as they say. Today tequila is considered Mexico's national drink and even has a city named in its honor, aptly named Tequila. Mexican jumping beans have delighted children for ages and definitely have a bit of magic about them. Placed in the hand, the little beans begin to 'jump', seemingly on their own accord. Many adults have fond childhood memories of being mesmerized by the jumping beans' antics. Not quite a toy but definitely a curiosity, the jumping bean needs to be credited for untold hours of amusement. Interestingly, however, jumping beans are not beans at all. Deep in the deserts of mainland Mexico as well as in certain parts of Baja California, a native plant grows that gives 'birth', so to speak, to the jumping bean. This plant bears flowers that moths find particularly attractive. These moths lay their eggs on the plant, inside a seed capsule. As the egg begins to grow, it starts to move around as the moth larvae inside develops. This is the famous Mexican jumping bean. Should conditions be ripe, some months later, a moth will emerge from the 'bean' and the cycle carries on. Deep in the heart of the Yucatan Peninsula grows the tropical sapodilla tree, whose trunk, when cut, oozes a milky white substance called chicle. This ingredient, in combination with flavorings and sugar, created the basis of our modern day chewing gum. Since time immemorial people have chewed on a variety of substances, ranging from sweet grass to wax to tobacco. However, it is chicle that deserves credit for the gum industry as we know it today. And, curiously enough, it is General and Mexican President Antonio Lopez de Santa Anna who helped bring this event to fruition. While in exile in the U.S., Santa Anna thought he had a great business idea. He imported chicle from Mexico in hopes it could be used as a rubber substitute in carriage tires. Alas, the chicle proved not suitable for this purpose. However, a business acquaintance named Thomas Adams, who had purchased the chicle from Santa Anna, discovered another use for the product, namely chewing gum. A whole industry was born and 'chiclets' became available in every corner drug store, to the joy of children everywhere. Today, the vast majority of chewing gum is produced with a less expensive substitute than natural chicle. However, the 'real thing' can still be found in certain specialty shops nationwide.